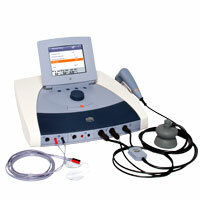 Ultrasound is one of the most well-known and applied forms of therapy in physical technology. The energy is transmitted to the tissue in the form of a sound wave by means of a “head” or transducer. The frequency with which this occurs is typically between 0.8 and 3 MHz. Not all tissue absorbs the ultrasound energy to the same degree. The effectiveness therefore strongly depends on the type of tissue that is being treated. The greatest effect of ultrasound occurs in that tissue where the energy is absorbed in an efficient manner. This is connective tissue (collagen) with a high degree of denseness such as ligaments, tendons, fascia, joint capsules and scar tissue. Although ultrasound has an effect on other tissue (for example, muscle tissue), the effect of ultrasound on an acute muscle rupture is less pronounced than the effect on an acute ligament injury. Knowledge of the type of tissue that is affected is of essential importance for the clinical decision-making process. In a recent study no significant effects could be demonstrated in the treatment of very acute muscle contusions while positive effects were observed in the treatment of ligament injuries]. 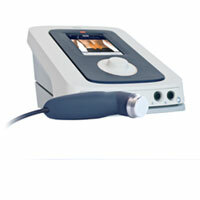 Ultrasound can be applied both in a thermal as well as in a non-thermal manner. A thermal effect is in place if a temperature of 40-45°C is reached in the tissue, which must continue for at least 5 minutes. Excessive thermal effects, which could particularly occur at higher levels of intensity, could damage the tissue. The non-thermal effects of ultrasound (including cavitation and acoustic microcirculation) would play a more important role than the thermal effects in the treatment of soft spot injuries. Cavitation occurs when gas-filled bubbles alternately swell and compress in tissue fluids under the influence of pressure differences (caused by ultrasound). This gives rise to a current movement in the tissue of the surrounding tissue. Due to this microcirculation the cell structure and permeability changes, which is considered as an explanation of the fact that ultrasound has a positive effect on wound healing. Non-inertial cavitation is the occurrence of stable bubbles which shrink and grow approximately evenly during compression and expansion. It is assumed that stable cavitation has a positive effect on the affected tissue. The microbubbles can also be instable, however, which is called inertial cavitation. These bubbles implode rather quickly, which causes many effects such as extreme increase of pressure and temperature. Instable cavitation can result in tissue damage. 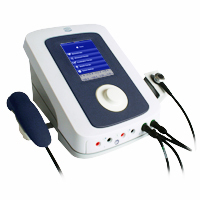 Instable cavitation should be prevented by using pulsed ultrasound with a very short pulse duration. The thermal effect of ultrasound consists of heating the collagen tissue and is the easiest to reach through the use of continued ultrasound in combination with high intensity. The non-thermal effects occur at lower energy levels and in pulsed mode and have cell “up” regulation as their objective. Non-thermal ultrasound is often used to speed up tissue recovery by optimizing the normal inflammation, proliferation and remodeling phase. Treatment during the proliferative phase of wound healing results in improved recovery of the function. The combination could possibly result in stimulation of fibroblast activity, increased protein synthesis, improved circulation, tissue recovery and bone healing. Ultrasound Frequency, expressed in MHz, is the frequency of the ultrasound waves. 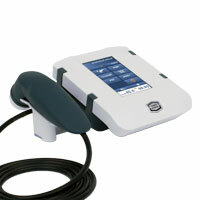 The ultrasound frequency determines the penetration depth, which has the largest value at 1 MHz. 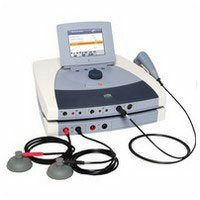 The ultrasound frequency can be set at 1 MHz or 3 MHz. Duty Cycle, expressed in %, defines the ratio of the pulse duration to the pulse repetition time. 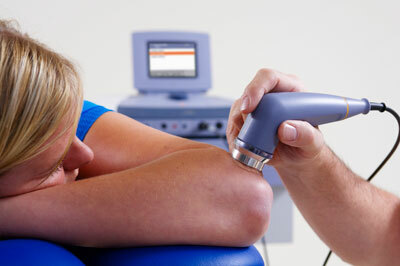 Ultrasound can be applied in pulsed or in continuous mode. When the Duty Cycle is set to 100%, the apparatus operates in continuous mode. Effective Radiation Area (ERA) expressed in cm², defines the cross-sectional area of the ultrasound beam (See technical specifications for details). 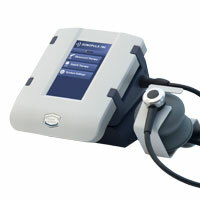 The Effective Radiation Area is fixed and defined by the size of the ultrasound applicator. Ultrasound Power is the ultrasound output expressed in W. The ultrasound output display can be toggled between W and W/cm². In pulsed mode the power during the pulse is displayed. The time averaged power can be obtained by multiplying this value with the Duty Cycle. Ultrasound Amplitude, expressed in W/cm², is the quotient of Ultrasound Power and Effective Radiation Area. The ultrasound output display can be toggled between W and W/cm². In pulsed mode the Amplitude during the pulse is displayed. The time-averaged Amplitude can be obtained by multiplying this value by the Duty Cycle. Ultrasound is indicated for conditions that benefit from the application of deep heat: relief of pain, muscle spasms and joint contractures. The objective of therapeutic ultrasound in the treatment of selected medical conditions associated with the chronic and sub chronic conditions of bursitis/capsulitis, epicondylitis, ligament sprains, tendinitis, scar tissue healing and muscle strain, is to reduce pain. These indications and contra-indications originated from the 4-Series Operating Instructions EN 1498751-41.pdf. Busse JW, et al. The effect of low-intensity pulsed ultrasound therapy on time to fracture healing: A meta-analysis. Canadian Medical Association Journal 2002; 166:437-441.